The idea behind a blue roof is similar to a retention pond—except that the pond in question is on your roof. Also known as a controlled flow roof drain system, a blue roof is designed to capture and temporarily store rainwater in detention systems, and then release it at a controlled rate. 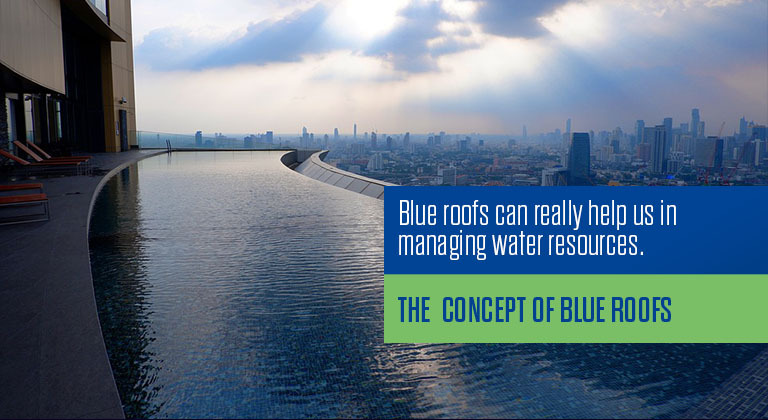 Blue roofs are most applicable and beneficial in highly urbanized cities that are serviced by combined sewers. (A combined sewer handles sewage and rainwater runoff from roofs, streets, parking lots, and other impervious surfaces.) On dry days, combined sewers can easily handle the amount of sewage flowing through them to the local treatment plant, but those systems can be overwhelmed on days with heavy rain, and can contaminate local streams, ponds, and oceans. Blue roofs delay the release of that rainwater, so the combined sewer system has time to process the runoff from other sources. Blue roofs can help reduce building cooling costs as well. The additional membrane need to support the water provides extra thermal insulation, while evaporation of retained water helps cool the roof. Some systems also spray the water back onto the roof to further cool the membrane and reduce heat gain. Most roofs are designed to remove water from the roof as quickly as possible in order to minimize damage from leaks. A blue roof’s goal is just the opposite. That means that the membrane needs to be 100% free of defects otherwise water damage will occur. One solution is to use blue roof tray systems. These systems rest on top of existing membranes and ballast systems, and do not result in any membrane perforations that require additional waterproofing. Plus, they have the added benefit of being able to fit around existing equipment on your roof. Blue roofs are typically less expensive than green roofs, often coming in at under $1 per square foot. One inch of water weighs 5.2 pounds per square foot. This can add a significant load to your roof, so an engineer will have to verify your building and roof can support this extra weight. Some facilities feature a combination of green and blue roofs, with the blue roof being used to water the green.